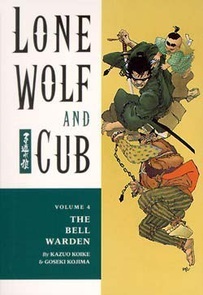 The fourth volume of this ambitious monthly program collects four classic Lone Wolf tales, including one never before seen in America, where little Daigoro searches for his lost father while amazing a well-known samurai with his warrior's eyes and cool demeanor. Also, the Lone Wolf takes on the sons of the war-bell warden, legions of organized crime bosses, and a mysterious tattooed lady with a dark story and impeccable killing skills. It's bloody and romantic and among the best the comics medium has to offer.